All four Republican hopefuls vying for the Michigan governor’s seat faced off for the first time Wednesday night in a debate that predictably featured sparring between leading candidates Attorney General Bill Schuette and Lieutenant Governor Brian Calley and, less predictably, a conversation that balanced spirited rhetoric with the real issues affecting Michiganders. The one-hour debate was in many ways a model of policy substance over campaign silliness, with the WOOD-TV moderator herding the candidates into supplying specific answers on issues critical to Michigan’s future: the state’s failing schools, crumbling roads and college affordability. They also tackled high car insurance rates, the opioid crisis, legalization of recreational marijuana and environmental challenges, from an oil pipeline under the Straits of Mackinac to lead-poisoned water in Flint. Related: Michigan’s governor candidates call for financial disclosure. Not all have done so. By contrast, a midday forum Thursday in East Lansing which featured the three Democratic candidates along with the four Republicans, was a bit more rollicking, with debates over the alleged threat of Sharia law in Michigan and Calley-Schuette bickering over foreign investments. 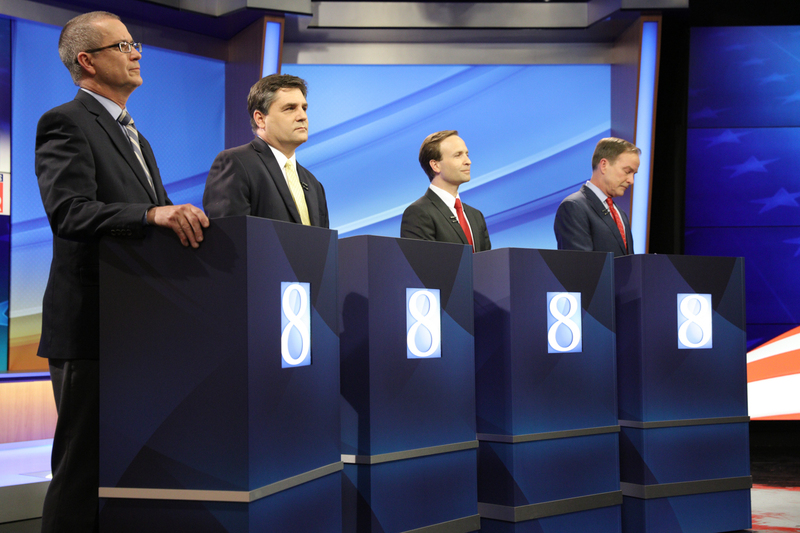 The Wednesday night event marked Schuette’s 2018 debut on the debate stage, with his opponents Calley, Saginaw-area doctor Jim Hines and State Sen. Patrick Colbeck having already participated in a series of debates that Schuette declined to join over the last few months. Aaron Kall, director of debate at the University of Michigan, said Calley, who trails Schuette in early polls, missed opportunities to begin his comeback — particularly by failing to lean on his endorsement from incumbent Republican Gov. Rick Snyder to combat President Donald Trump’s endorsement of Schuette. The two have similar favorability ratings among general election voters. Michigan GOP hopefuls have a choice: Love Trump or leave race. Frontrunner Schuette, on the other hand, “played his cards well,” Kall said. While the candidates leaned on rhetorical campaign props regularly throughout the night, they used the majority of their time talking about how they hope to address the issues Michigan residents have said are the most pressing in 2018. In most instances, the candidates skimmed the surface ‒ perhaps understandable when given only 60 seconds to answer. Here’s how they responded, and at times avoided, questions on Michigan’s big problems. Michigan’s education system has slided into crisis over the last decade. Despite small progress indicated in an April report, the state’s elementary and secondary systems are now among the nation’s worst in student achievement. Fewer than a third of Michigan adults have a bachelor’s degree, and those who graduate have the 11th highest rate of debt in the nation due to college tuition costs rising faster than inflation. The candidates were given two short opportunities to say how the state could solve these problems. Most of their answers focused on helping students become workforce ready rather than providing concrete ways schools can equip kids with the skills to succeed after high school, but they offered several real ideas. Hines’ answers on education were the least substantive: “I don’t think money is the answer,” he said. Rather, volunteer reading coaches and Hooked on Phonics, a commercial education tool, were among his preferred solutions. Schuette spent half of his allotted time with aphorisms — “I think education policy in Michigan is a four letter word spelled K-I-D-S, with parents in charge,” he opened — but later pivoted to suggest funneling more money to high-performing schools and implementing a program that would help students traveling greater distances, such as students with special needs, to secure transportation to school. Colbeck was the only candidate to mention the cost of education: a relevant observation given many reform plans can be extremely expensive. He suggested universities need to cut their own spending, while offering a bill he’s introduced as a way to create more funding for both K-12 and higher education by implementing private school strategies in public schools. What was missing? A robust discussion of helping middle-class students get into and pay for college. The candidates’ focus on workforce development largely squeezed out practical discussion about post-secondary education, which economists agree is the key to high-wage jobs and economic prosperity. For many Michiganders, devastating losses from the Great Recession haven’t yet faded. Businesses are bouncing back, but employers struggle to find well-educated job candidates and Michigan still isn’t a top-10 state for jobs, income and the economy. “Michigan’s a bread-and-butter state and the economy is still really, really important,” said John Truscott, president of Lansing-based public relations firm Truscott Rossman and a former press secretary for Republican Gov. John Engler. Economic issues were among those most peppered with platitudes during the debate. The candidates didn’t have many opportunities to address this question, but when they did, they came back to one unifying rallying cry: Cut taxes. Schuette and Hines said they’d repeal the “Granholm income tax” multiple times, a reference to the 2007 law that increased Michigan’s income tax to 4.35 percent. Schuette said the law has cost taxpayers $8 billion and implied that repealing the tax would boost the state’s economy. “We need to be a place where jobs and paychecks are created,” he said. Neither candidate said much about what such tax cuts would mean in lost revenue to the state. Calley pointed to the importance of skilled trades in preparing kids to enter the workforce and Colbeck, an engineer, suggested promoting STEM programs such as FIRST Robotics. Substantive discussion of some of the states most pressing economic issues such as Michigan’s looming MEGA tax credit payouts were missing. However, the questions they fielded didn’t lend easily to broad-ranging discussion. Protecting the environment is a bipartisan concern in Michigan, where bountiful freshwater, coasts, wetlands and forests are often the cornerstone of the state’s recreational and economic industries. From the continued threat of toxic chemical sites to the controversy over the Enbridge Line 5 pipeline, the candidates showed up with real answers that provided some of the most concrete — albeit limited — policy proposals of the entire debate. Schuette suggested building a utility corridor along Line 5 that would allow for regular safety inspections. He also said he’d propose policies that would help energy producers get their product to market and that he is opposed to water diversion, possibly a reference to the Foxconn lake diversion. Hines was the only one to discuss the costs of environmental protection. He suggested the state pay to clean up the state’s thousands of toxic sites by charging more for trash sent to Michigan from other states and Canada. Colbeck said he’d create a system where environmental projects are prioritized based on the size of the population impacted by potential contamination. There were some areas where generalities abounded: Calley said he’s “come to the conclusion that we need to eliminate the risk” of Line 5 and referenced a feasibility study offering solutions, but did not specify which he’d support. Schuette spent half his time calling the environment “a big responsibility” and Hines vaguely said “we’re responsible for doing something” about Line 5. The candidates drew sharper lines in squabbles over the Flint water crisis. Instead of proposing ways to ensure communities are safe from lead, Schuette and Calley took their mitts off over the Attorney General’s ongoing prosecution of city and state officials over alleged criminal misconduct in Flint, which as been a sore spot for both candidates in previous weeks. “The Attorney General used (Flint) as though it is some sort of launching pad for a campaign for governor,” Calley said. Even Hines and Colbeck, who didn’t completely dive into the fray, failed to offer concrete steps. Hines said the state should not spend more money but should return to supplying bottled water to anxious Flint residents and Colbeck vaguely said the state should focus on environmental quality metrics. Some of the most controversial issues raised during the debate offered plenty of opportunity for bluster, but also revealed some minute policy differences between the candidates. They were asked how the state can ensure students are safe in school in the wake of mass shootings such as the February shooting at a high school in Parkland, Florida where 17 people were killed. Their solutions were often vague and focused on improving mental health. Schuette called for more initiatives like OK2SAY, a hotline for potentially dangerous activity in schools. Calley said a three-tiered approach of “hardening” school buildings, monitoring campuses and communicating with police should help. Hines said school counselors need to report when they notice problems in students’ mental health, though he did not say to whom or what would happen after reporting. Colbeck indicated he believes schools should eliminate gun-free zones so school workers can carry weapons to defend students. A ballot measure that would allow voters to legalize recreational marijuana also reveals small fissures among candidates. The proposal will go to voters unless the Republican-led legislature chooses to vote on it first. Experts have said the question reaching the ballot could drive Democrats to the polls. All four said they don’t support recreational marijuana but that they would respect whatever the public chooses. But Calley went further to say he supports medical marijuana and took the opportunity to slam Schuette for pushing back on the drug after it was made legal by voters in 2008. Your bias is showing! Like saying “she doesn’t look half-bad for a fat lady”. This debate was a sham to the public. Schuette and Calley both along with Snyder still need to be held ACCOUNTABLE for their part in the Flint Water Crisis, and Schuette for MSU. Not one of these Candidates went into how they would fix anything, other than pointing out the problems we Michiganders have within this great state. I personally would love to have a debate with any of them. But the media is biased against the Independents and the Minor Parties. As a Candidate myself, these clowns along with the Democrats have lost touch with the People and deserve better for the People of Michigan. The Democrats and the Republicans only care about their parties and how much money they can accumulate for themselves along with the party.